So you’ve been selling on Amazon for a little while now. You know the ropes, launched a product or two and revenues are steady. You’ve got grand ambitions, but you’re unsure exactly how to take it further. Lots of FBA sellers find themselves in this position. They’ve had a taste of success and they’re ready to double down and scale their businesses to the next level. They question how this can be done without increasing their workload. In fact, most want to grow their business while phasing themselves out of the grunt work. In reality, scaling an Amazon FBA business can be more straight-forward and less work than it seems. If you’re smart you can leverage your existing assets, experience and customer base to increase your revenue. Looking for inspiration for adding digits to your monthly Amazon income? Here are 6 ways to transform a humble FBA operation into an e-commerce empire. Here’s a list of the top 6 ways to grow an Amazon business. These are tried and tested methods that sellers are using today that have had an exponentially positive impact on their revenue and profits. Ultimately it comes down to you to make the final decision, and you could choose to use one or more of these scaling tactics listed below. You’re already selling in a particular category and niche, so you’ll have gained a fair understanding of your customers. So why not continue to build your brand to cater to them more? The next step of the process is looking at supply and demand. Pick out products with great potential for boosting your revenue. Consider higher value products, higher margin products or low margin high volume products. When it comes to sourcing, go the extra mile to source high-quality products. Visiting Canton Fair is a great way to discover new products, experience them first hand and establish relationships with suppliers. The benefits of launching new products in the same category of niche as the one you are already successful in is that it usually makes for less product research to build out your listing, and if you have a trademark and are in the brand registry, you can often use the same trademark as it’s in the same category. However, it’s also a solid approach to launch products in entirely new categories. This way, you are being less prescriptive, and therefore more likely to find the best opportunities with high demand and low competition. JungleScout’s Web App makes it easy to find products selling like hot cakes and estimate profitability. Use the smart filters to find products in a range of product categories that have the highest demand and lowest barrier to entry. Perhaps you didn’t consider this one, but it can be an easy way to increase revenue. Instead of launching similar products under a completely different listing, why not piggyback off your established ones? Launching a new product under a new listing takes time. You’ll need to gather reviews and drive sales to climb up the ranking. But if you add a child ASIN to a high performing listing, you’ll get a chance to get exposure from the get-go. However, if you wish to rank for different keywords or take up more real-estate space on search results, you might consider a separate listing. Just be sure you have a good launch strategy in place to gain momentum! The Jungle Scout Million Dollar Case Study used this strategy, and launched several variants of the publicly launched Baby Hooded Towel. We discovered designs and colors that sold well for competitors and added similar variants using our existing supplier. 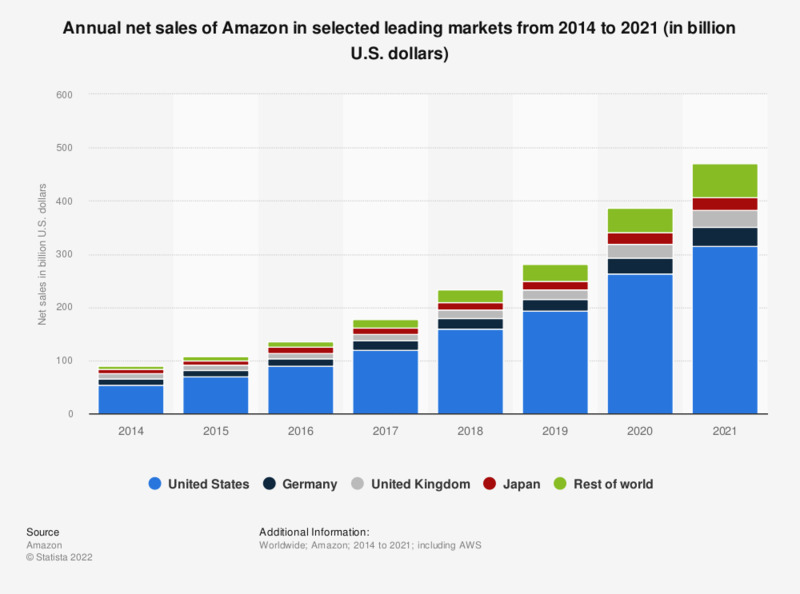 While Amazon US leads for net sales, expanding into the other leading markets is still very worthwhile. Amazon is even willing to assist you with shipping existing stock to their international warehouses. Germany, United Kingdom and Japan markets can provide great additional streams of revenue. These markets have varying levels of supply and demand, customer demographics and competitors of course. You’ll need to research each market to find the best opportunity for your brand in different regions. Also, check out this Million Dollar Case Study Europe edition, for a full step-by-step view of expanding into the European market for inspiration. It makes perfect sense to maximize your existing assets before expanding into new territory. Besides, optimizing your product listing will have a powerful effect on ranking, exposure, click-through-rates, conversion and resulting revenue. Working on improving your Amazon SEO could greatly increase your exposure and attract more customers. There’s a whole bunch of factors that can be tweaked to optimize your Amazon listing. But the biggest issue is being able to track these changes and tie them to increased profitability. That’s why we use split-testing, so we can confidently make changes based on clear evidence. Being able to measure the impact on sales and ranking enables you to continually optimize Amazon listings. Read more about split-testing amazon listings for profitability. On top of that, optimizing your pricing is usually the single most impactful thing you can do to move the needle. As a private label seller, you are not able to use the countless “repricer” tools out there, which are designed to help Wholesale sellers who are competing for the buy box. This is why Profit Peak was created at our sister software, Splitly. This tool harnesses machine learning to give private label sellers the power to keep their pricing optimized at all times for higher profits. The biggest benefit of selling on Amazon is leveraging their massively popular marketplace, getting your product in front of hundreds of hungry shoppers every day. It’s a great place to launch products and make impressive revenue. But let’s not forget the fact, Amazon is only a single channel. If you’re looking to build a well-rounded, more secure business, you’ll need to be able to stand on your own two feet too. Amazon is by far the largest Marketplace, with the most opportunity to scale and run a hands-off business through the use of their fulfillment service. Additionally, with the biggest audience of ready-to-buy shoppers, it’s the lowest barrier to entry when it comes to marketing. But some business owners still want to diversify and sell their products on multiple channels. Rather than growing vertically, why not try expanding horizontally too. Incorporating multiple business models is a great way to leverage your existing assets and strengthen revenue. UpFund provides inventory financing for Amazon sellers looking to grow. They offer low, flat-rate fees compared to an APR based loans. Plus you’ll start paying back as you sell your inventory. Kickstarter is a crowdfunding platform that’s helped thousands of new ideas and innovative products get off the ground. Amazon now has their own section for successful Kickstarter Products now available on Amazon. Indiegogo is another crowdfunding platform that’s well worth checking out. If you still haven’t hired VAs or built a team yet, now is the time to do it. Scaling your business doesn’t need to require as much extra work if you leverage skilled professionals and freelancers. Looking for Freelancers? Get on the list for the beta launch of the Jungle Market! If you’re still not sure, a great place to start is by using our profit analytics tool, Fetcher. As well as taking care of your accounting it can really help you gain a better understanding of your business. Laying out your financial data in a meaningful way makes it much easier to see where costs, or to identify opportunities for growth. So here you have it, numerous ways to scale your existing business, plus solutions to common problems. So what are you waiting for? We recommend choosing a single strategy that makes the most sense for your business. Focus on one at a time before trying to conquer the next horizon. If you’ve got any ideas to add or experiences scaling your FBA businesses, we’d love to hear from you in the comments below. Can you provide a link or additional info on this? I’ve searched the Seller Central Forums and can’t find anything about them doing this. Hey, this article is great. it will provide in-depth guidance for those newbies in the Amazon business industry and this will keep them guided on how to increase solutions to their Amazon concerns.